This is the year that makes five hundred since Filofei, a very clever monk of Pskov, wrote an appeal to the ambition of Vasily III, Grand Duke of Muscovy, letting him know that if he played his cards right with the Church, the Church would take care of him better than it had managed in faithless Constantinople. “Now two Romes have fallen, but the third stands, and the fourth there shall never be… No one will replace your Christian Tsardom”, Filofei wrote in either of three letters, or in all three, starting in 1510; or possibly in 1525; or possibly later. In return, Filofei wanted Vasily’s backing for his promotion to the bishopric of Novgorod, and several real estate guarantees in downtown Muscovy. They were needed to increase the churchmen’s power in their rivalry with the boyars. However, the only big thing Vasily is remembered for is helping to conceive Ivan IV, the Terrible; he put an end, once and for all, to the power grab of Filofei. 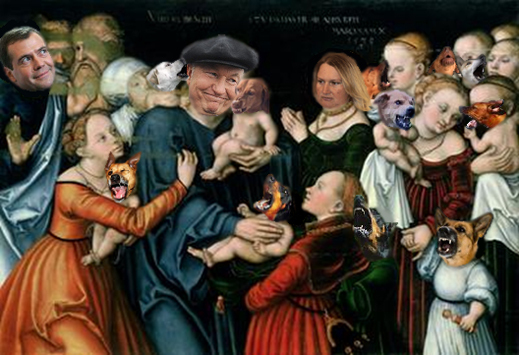 Although this too is a Time of Troubles for Yury Luzhkov, greatest ruler of Moscow in living memory, and all sorts of faithless people want to topple him, the benevolence of the man, who is an ornament to the culture of his city, is nowhere better illustrated than in the latest edition of the municipal statute on dogs (cats too). But nothing evinces how sorely this Time of Troubles is affecting Mayor Luzhkov than the fact that noone among his underlings wishes to own up to drafting the new Dog Code. A posting on the city government website appears to endorse a newspaper summary as accurate, but there is no sign of the statute as such. The press spokesman for the city government, Alexander Kokhlov, said he is refusing to say anything on the Dog Code. The press service of the Department of Housing and Public Utilities admits that the code originated there, but adds: “The document is at the draft stage. 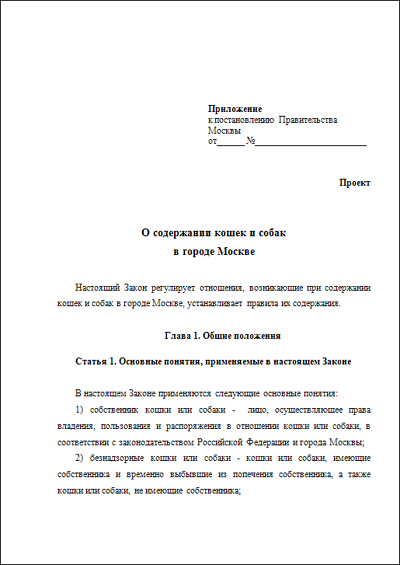 The deputies [of the City Duma] may reject or substantially modify it. So it is too early yet to talk about the rules, which will regulate the lives of cats and dogs in Moscow”. The Housing Department says the official responsible for the code in its present form is named Viktor Pchelovodov. He is unavailable. But since the name might be translated as “Bee Keeper”, there is no telling whether the official exists at all; and whether the name is a sly reference to the Mayor himself, whose passion and avocation for bee-keeping are famous. Is the purported Dog Code then a plot to heap ridicule on Luzhkov? Living in the residential sector pets should eat normally, be able to celebrate their natural desires, and receive veterinary care. Without a leash and muzzle dogs may be walked only at specially designated sites. Dogs may not appear in the territories of clinics, hospitals, kindergartens, schools, or cultural institutions, with the exception of parks, nor at a distance of less than 30 meters from the entrances of homes and places of mass gatherings. Dogs which weigh over 15 kilograms may not be taken out for walking except by adults over 14 years of age, and by persons who meet the test of sobriety. Dogs which weigh less than 15 kilograms, but which belong to 40 especially dangerous species, may not be taken out for walking except by adults over the age of 14, who are not drunk. Notwithstanding the size, weight or breed of dog, no person may walk more than two dogs at a time. However many dogs a person is walking, the person is responsible for collecting the dog excreta. Four-legged inhabitants of the cellars, attics and stairwells of apartment buildings may continue to maintain their residential status only with the unanimous support of all residents. The death sentence may be executed upon dogs and cats in the following circumstances: when they reach old age, suffer a persistent disorder of their bodily functions, are susceptible to unprovoked anger and aggression which threaten life and health, and in the presence of incurable illness or injury, including detectible rabies. Victor Pchelovodov has been verified as a real name, and confirmed as the deputy head of the Moscow Government’s Housing Department and Public Utilities. The department spokesman said the department won’t comment on the draft, because “it has just been written, and no discussions have been held yet.” Pchelovodov is still uncontactable, and according to his colleagues, he may be on holiday. The draft animal code was posted on the department’s website on September 10. Here it is —О содержании кошек и собак в г. Москве. 3. American Pit Bull Terrier. 18. Canary Dog (Perro de Preso Canario). 25. Malorsky Bulldog (Terra De Mallorquina). 26. Maremma (maremoanho-abrutskaya herding dog). 35. Superdog and Yogo crossbreed with maikong. 36. Tosa-Inu (Japanese fighter dog). 39. Shar Pei (Chinese fighter dog). 40. South Russian Shepherd Dog.